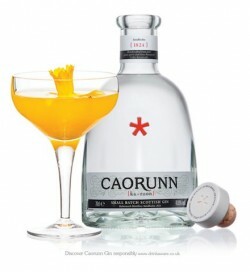 We make no secret of how much we love Caorunn Gin. If you want to explore it for yourself here’s where you’ll find Caorunn out and about at this year’s London Cocktail Week. Just grab your wristband here London Cocktail Week and get sipping. Caorunn perfect serve Gin and Fever Tree Tonic, cocktail by Ervin Trykowski with ingredients foraged at Balmenach ‘Rich Pickings’ and the incredible ‘Super Tonic’ by the legends at Edinburgh’s Panda & Sons on the menu all week long. Guest interactive session Thursday 9th 3pm, and more spots throughout the week. Brand new cocktail all week as part of £4 wristband offer in the stunning new flagship venue in Clerkenwell. Meadow Lady: Carounn gin shaken with home-made meadowsweet liqueur, lemon juice and egg white. Another brand new cocktail for £4 wristband wearers in this designated home for gin lovers and bon vivants. This time it’s Caorunn Peters Blackberry Gimlet: Caorunn Gin, foraged blackberries, fresh lime and sugar. Enjoy a sensory experience where the urban and rural come alive. With brand new, bespoke cocktails daily using foraged ingredients from internationally renowned guest bartenders, and Foxhall’s AW14 FUTURELONDON collection.